July 13, 2016 — Over the past thirteen years, the International Cryptozoology Museum (ICM) has moved four times within the city of Portland, Maine. It’s getting almost as elusive to pin down as the cryptids it celebrates. I’ve written about this place three times, once in The New England Grimpendium and twice on OTIS, all of which covered number two and number three of the museum’s incarnations. 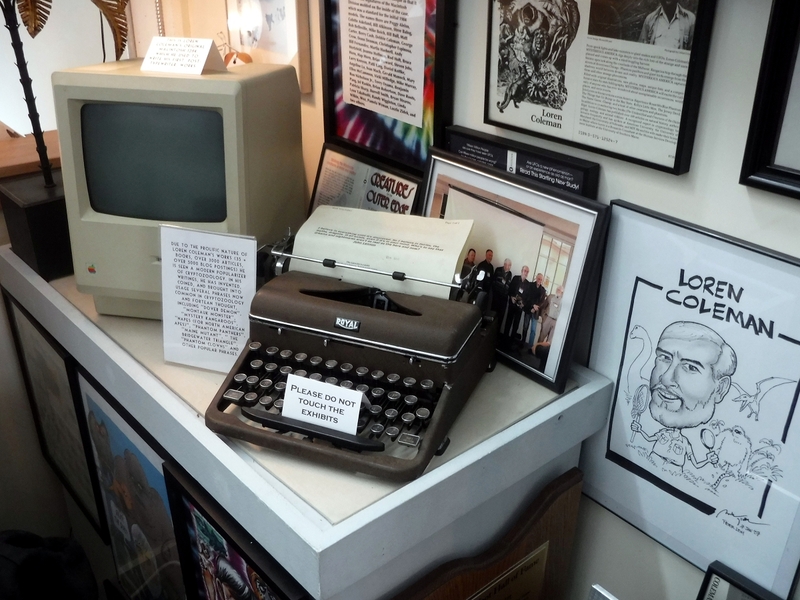 Last weekend, I went to its brand new digs, and this is the fourth time I’ve written or posted about the ICM. Usually to get that much press on OTIS, you’ve got to be Salem, Sleepy Hollow, or Edgar Allan Poe. 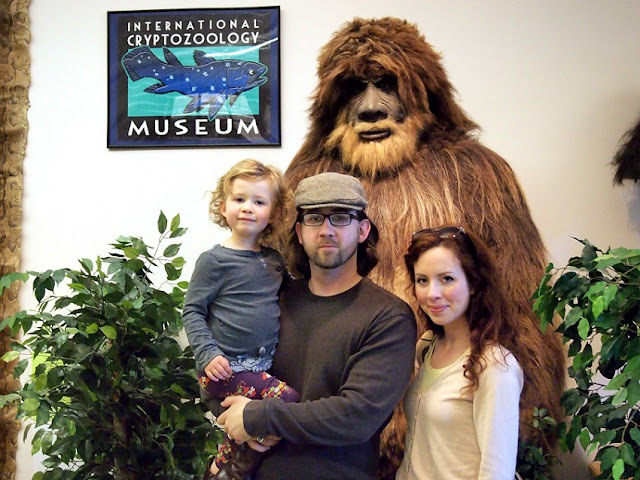 The museum was created and is curated by Loren Coleman, who has become the official spokesperson for cryptozoology, which in some ways must be like being the keeper of an empty zoo. But he’s a knowledgeable presence on a scene full of credulous reality TV show characters. 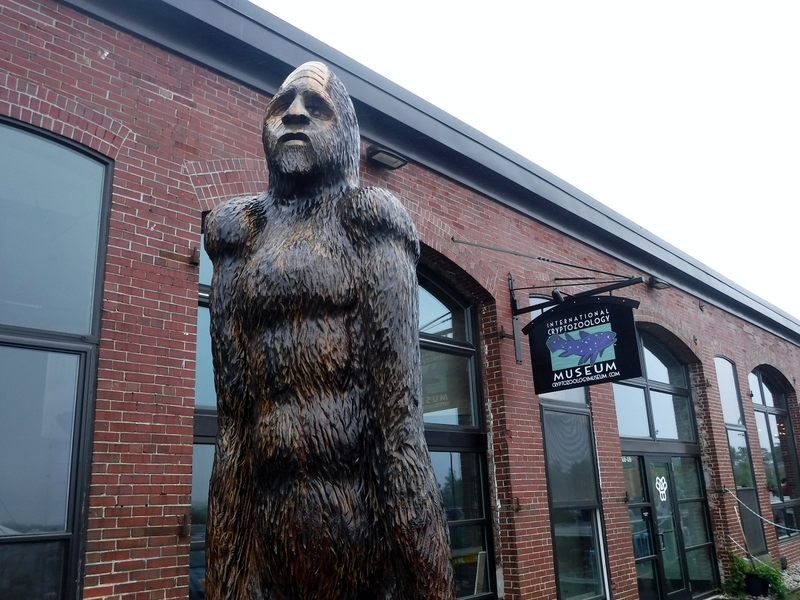 With this new location, he has left the hipness of downtown Portland, where it had a spot behind the Green Hand Bookshop, to head out to Thompson’s Point, a nearby bump of land on the Fore River that’s starting to come into its own. The area used to be an industrial site, but is currently being redeveloped into an arts and entertainment center. Already, there’s an outdoor theater venue, a circus school, a makerspace, a brewery, and a winery. And now it’s home to monsters. At least, that’s how I sold the museum to my kids. As a monster museum. Also as a toy museum. Both are accurate. As we pulled into what is currently a dirt parking lot, we didn’t need to look for the familiar blue coelacanth sign that identifies the museum and is its mascot. 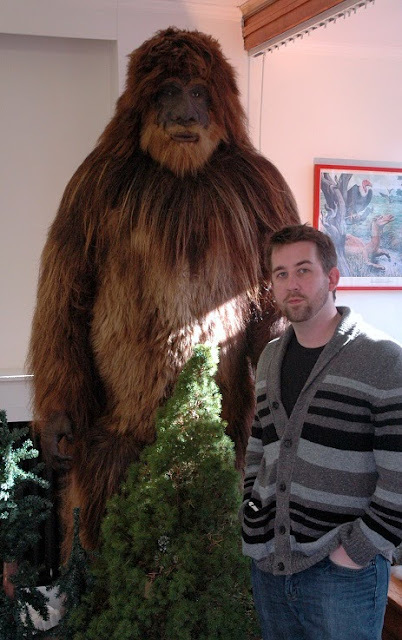 Because Bigfoot. A 10-foot-tall wooden statue of him loomed outside the entrance, a new acquisition for the museum. He was thin, with male-pattern baldness and a sad expression, as if he knew that not everybody in line for the winery next door believed in him. I’m really hoping Coleman surprised his landlord by putting that thing out front. Inside, the layout of the museum is as odd as its content. It’s bifurcated into two long, thin halls, one upstairs and one downstairs, each lined with more than 10,000 items related to cryptids, from actual artifacts like Bigfoot hair and footprint casts to pop culture references like action figures and beer labels. 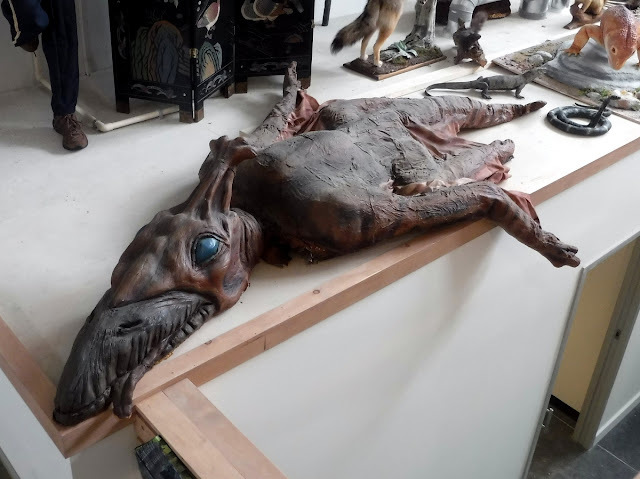 The ground floor is a dedicated to a variety of cryptids, including hoaxes and jokes like jackalopes and FeeJee Mermaids and more conventional stars of cryptozoology like Ogopogo, Mokèlé-mbèmbé, and Teenage Mutant Ninja Turtles. Yup, that last item wasn’t a joke. I would like to explain this photo, but sometimes I get overwhelmed and excited at museums and totally forget to read or take pictures of the informational placards. Like this time. 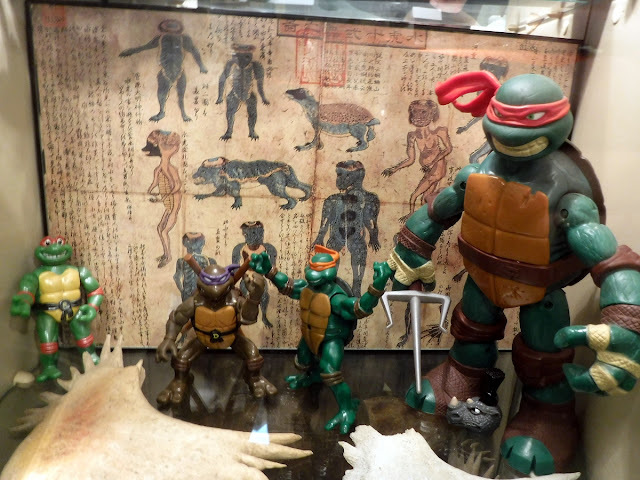 Maybe they are a reference the sword-bearing Hoan Kiem turtle, although judging by that manuscript copy behind them, that's probably not true. Upstairs is the second part of the museum, where a long atrium that overlooks some of the lower floor. 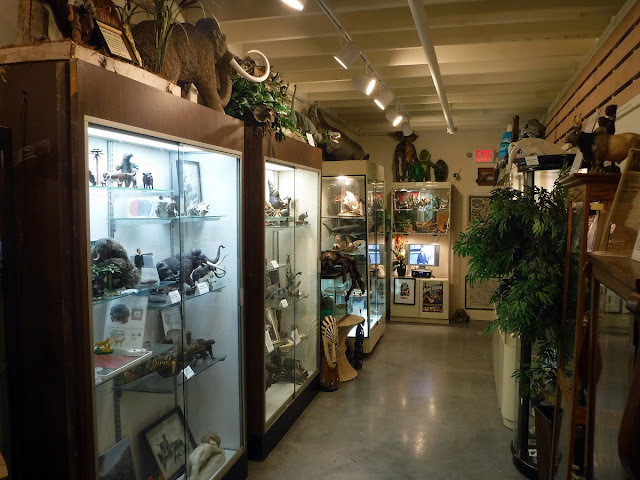 Most of that space is dedicated to Bigfoot and his cousins Yeti and Sasquatch and Skunk Ape and all the other hairy giants, and is probably the best part of Coleman’s collection. 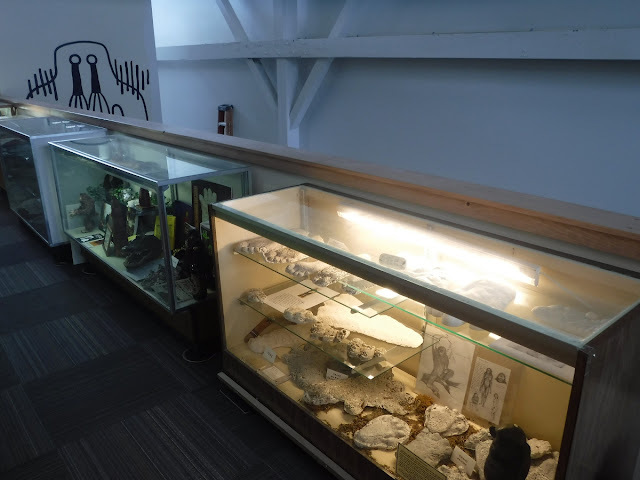 Throughout the museum, all my old favorites were there: the 300-pound Crookston Bigfoot statue, the pterodactyl prop from Freaky Links, the Creature from the Black Lagoon exhibit (the creation of which was inspired by the discovery of the Coelacanth). 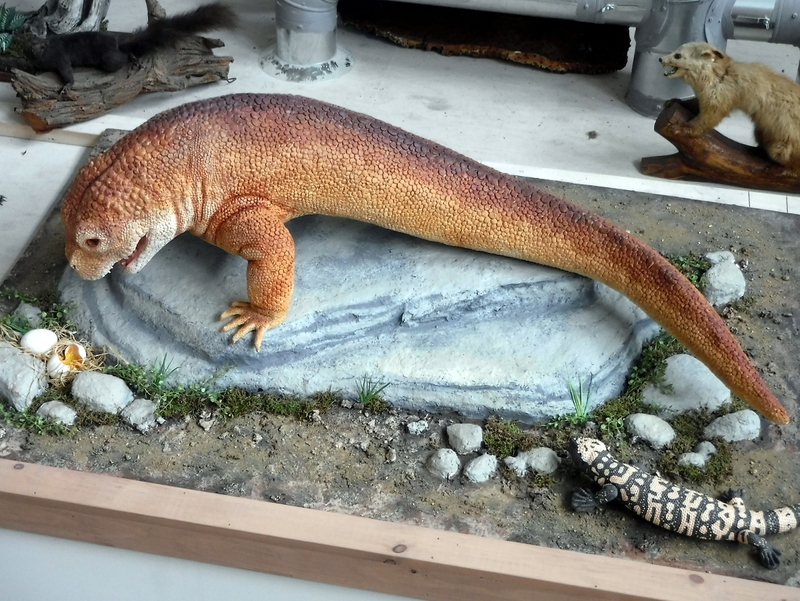 Also new favorites like the Tatzelwurm replica. 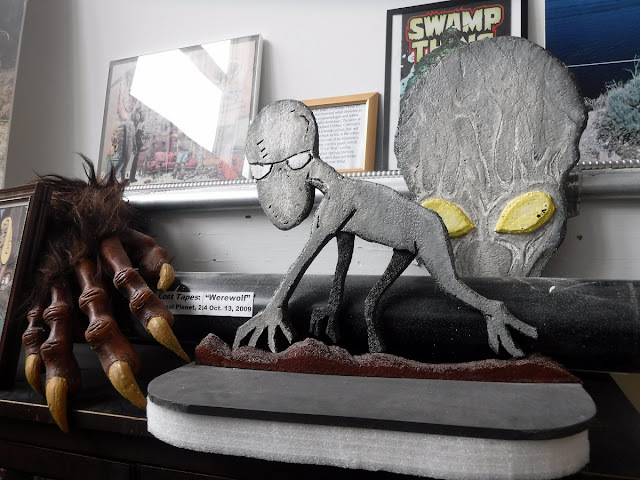 I showed my kids Mothman, the Flatwoods Monster, the Jersey Devil. 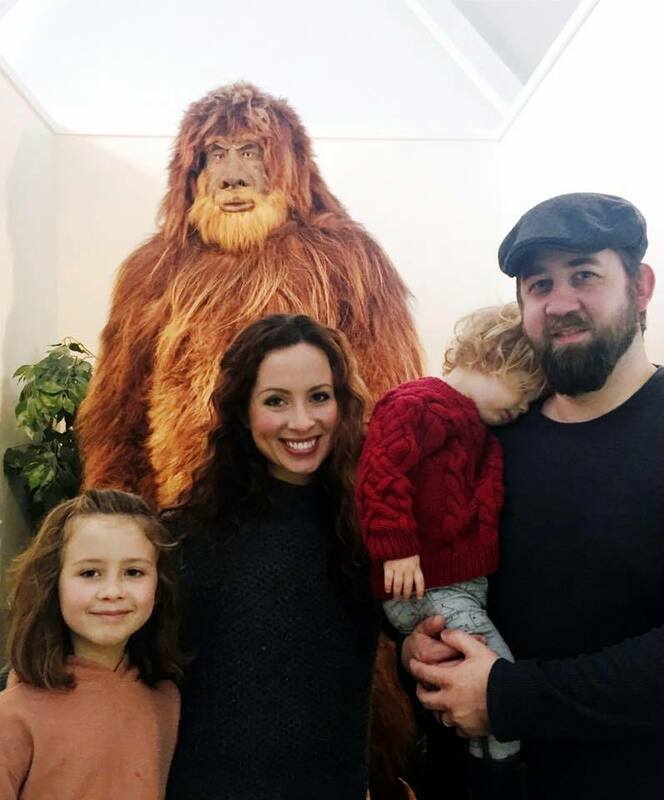 As to their responses, my six-year-old’s can be summed up by one statement she made as she pointed at a monitor playing the Patterson-Gimlin Bigfoot footage: “Look, Dad, Bigfoot’s real, see?” To give you some context, she does believe in Santa Claus, but is just now starting to be suspicious of all the promises in televisions commercials (although not totally). Before we left, I bought my kids matching okapi toys in the gift shop (because I couldn’t talk them into a lake monster or a yeti toy for some reason), and then we said goodbye to the wooden Bigfoot outside. I really dig this collection. Partly because I dig monsters. But mostly as interpreted as the physical expression of one man’s obsession. And that’s a big reason why I resisted the temptation to make every photo in this post blurry.